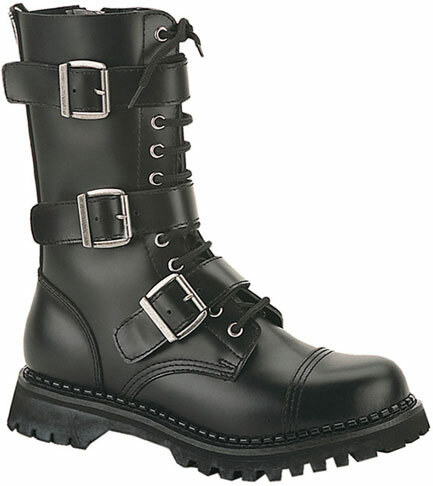 The Riot-12 Demonia boot is a 12 eyelet steel toe combat boot. 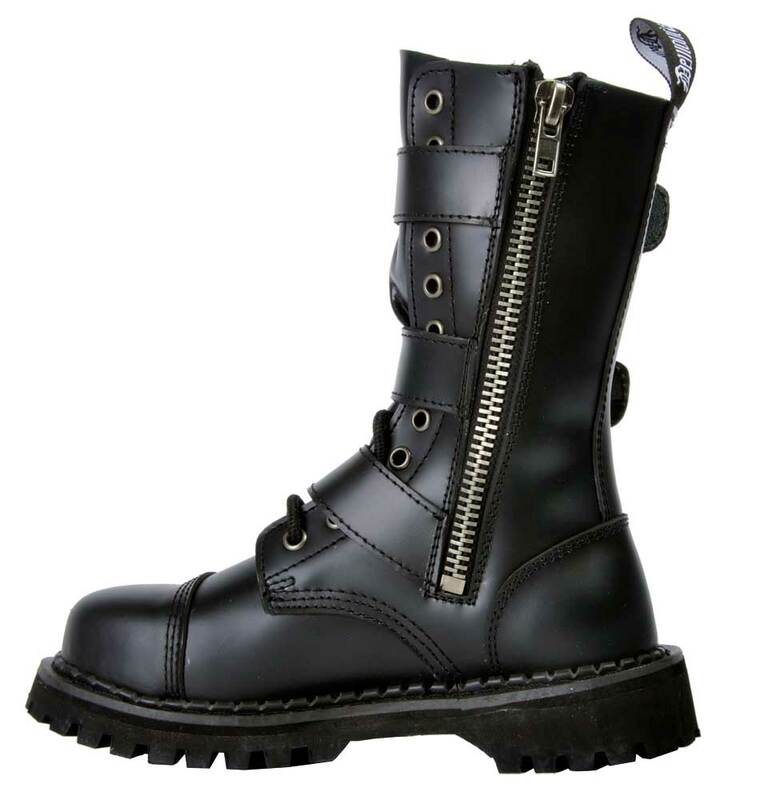 These durable boots have full uppers made from triple stitched leather and a man made rubber sole. Nobody likes to lace up their boots every day so, the Riot-12's have a full inner zipper incorporated into them making lacing a one time ordeal. 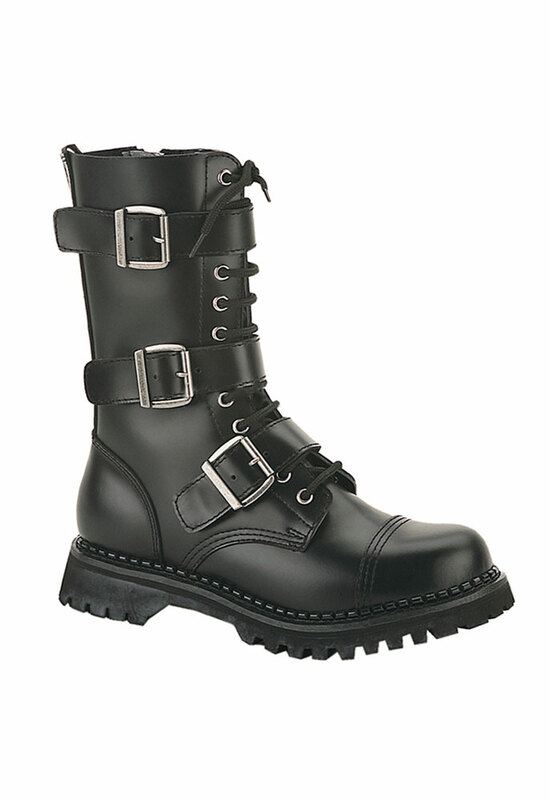 To set these boots apart from the rest they have 3 sturdy buckle straps across the the lacing. You really can't go wrong with these boots. Not only are they comfortable they look great too. I liked the price and I love the look of the boots. They are steel toe so I can wear them to work. But they hurt the top of my foot. Not sure what it is. But something rubs and is super uncomfortable. Wish they would carry the half sizes. Then it would fit perfectly. I bought the size 4 in men since that makes it a 6 in womens. I've tried loosening the laces but it doesn't seem to work. I hope they just need me to break them in so they feel better. Because of now, they hurt my feet. Shipping was at a timely matter. Very sturdy but not too heavy. They look good, they feel good, love them. I just got these boots and i love them! They're so comfy and the leather is soft as hell. Also the leather smells so awesome. I just love that smell of fresh leather. Just fyi boot sizes for men are one size smaller than regular skate shoes. I will definatly wear these boots everyday! These boots are great. They are super comfy and look great! 16 people found this usefull. Was this review helpful to you?